Day 135: Shake, Rattle and Roll . . .
It’s no big surprise that we love a good Zinfandel. The pepper, the spice, the fruit . . . it’s a terrific combination and probably the true American varietal. We’ve reviewed a variety of Zins in the first 134 days of this blog and some have been good and some not so much. Having spent last night (Saturday) at the Central Market Cooking School with Chef Brian Overhauser from Hahn Winery in California, we learned a LOT about this family run business and the far-reaching parts of it that includes multiple wine labels with vineyards in several places in California. What made the cooking school so incredibly special was getting to see Chef Brian again. . .yep, when we visited California back in October of last year, one of our first stops was at the Hahn Winery in Monterrey County. It was a beautiful afternoon, and after some terrific wines in the tasting room, we were invited to stay for Chef Brian’s, “Wine Country Tapas” Menu for lunch. All six of us were absolutely blown away by the amazing pairing of food with wine. It zeroed in on the beauty of good foods with good wines. So, when Jean found out that Chef Brian was coming to Austin for a Central Market Cooking School, she found the perfect Christmas gift for husband Brian. And it was perfect. From the Pinot Gris with a cold watermelon soup to the Estate Chardonnay with a lobster salad–and three more dishes paired with Hahn Wines, we were treated–once again–to an amazing combination of food and wine. The final course of this cooking school was a stuffed pork tenderloin served with a new Zinfandel from the Hahn family. It wasn’t available in Texas until last night, and OMG, this one is a beauty. Now, it’s young; it’s a 2011 Boneshaker Zinfandel from their Lodi, California vineyards, but if it’s THIS good while being so young, we are really fired up to enjoy it when it’s a little older. We had heard that 2011 was a terrific year in that part of California, which for us Zin lovers, is magic to our ears. Boneshaker is a “rock on” style of Zinfandel. Deep purple in the glass, this wine has an aroma that reaches out of the glass and grabs hold of you with notes of ripe plums, hints of vanilla and blackberries. A taste shows off dark flavors of chocolate and black cherries underscored by a hint of sweet tobacco. This Zinfandel is as full-bodied as they come, with fine-grained tannins on the mid-palate and a long finish made up of subtle notes of spice and coffee. This wine is great on its own, but it truly shined along side the pork tenderloin prepared by Chef Brian. 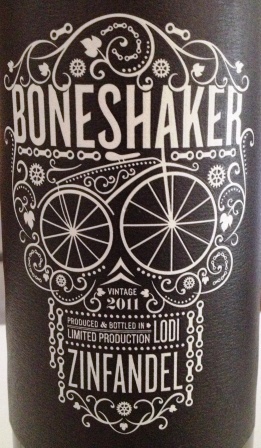 We learned that the wine is from Lodi’s old Zinfandel vines, this vintage of Boneshaker is big and bold. It’s one thing to visit a winery and their chef and come home and resume your ‘normal life’. It’s completely different when the chef comes into our backyard and prepares something out of this world–and focused on Texas citrus fruits–and pairs the dishes with some awesome wines. We’ve become big fans of Hahn’s wines, and a big part of the reason for the shout outs to them is because of Chef Brian. In fact, he told us that he’s working on a cookbook and hopes to have it out by around this time next year. We know who will be waiting to get a copy of that bad boy!!! So, we have some recipes and cooking techniques and wines so the next step is to try some of them ourselves. . .but it sure is cool to watch the pro’s do their work. And, we have to give big-time kudos to the cook team at Central Market. . .Chef Christina and her group worked their tails off and at the end of the night, you could tell they were ready for a break . . .or a drink!!! Boneshakers is now available at Central Market for less than $20 a bottle, so if you’re looking for a Zinfandel with the ‘chops’ to bring home the bacon, then grab some bottles of this wine. And, regardless of your wine of choice, please enjoy it responsibly and remember to recycle whenever possible. Categories: Uncategorized | Tags: CEntral Market, Chef Brian Overhauser, Hahn Boneshaker, hahn winery, Zinfandel | Permalink.